How to Improve Putting with a Proper Putter Relationship from "No 3 Putts"
Most golfers believe they are good putters, but in reality they do not putt very well, even from 3' and 6'. 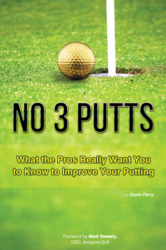 A new book, "No 3 Putts" will help all golfers understand what it takes to be a great putter and avoid 3 putts. In his new book "No 3 Putts," David Perry interviewed top rated instructors and club fitters to learn what the key limitations are to great putting. One key reason is your relationship with your putter. A simple 6 foot putt is seemingly one of the easiest shots in golf, yet the average on the tour is only near 50%. The 3 foot putt should be made about 90% of the time. The relationship that the golfer has with the read of the putt, the face of the putter at impact, the grip and the stroke during this simple effort are indicators of how well the golfer will do with the rest of their game, according to Becky Dengler, a PGA Master Teaching Instructor. The putt is one of the fastest ways to improve a poor golf score. While many people will buy expensive drivers and spend time on the driving range, they spend almost no time improving skills on the putting green. This needs to change. Putts are about 50% of the golfers score, so golfers need to spend an appropriate amount of their practice time on the putting green. Learn how an effective relationship with your putter by reading about this topic and many others in No 3 Putts, a new book by David Perry. The book contains exclusive interviews with top rated instructors and club fitters, that will help you better understand the putting environment, learn skills needed to avoid 3 putts and improve your putting and golf game. No 3 Putts and David Perry is dedicated to helping golfers avoid the putts and improve their overall golf game.